It’s easy to get caught up in the holiday season hustle and bustle. For many of us, this includes higher stress levels, busier schedules, and getting a little off track with our health and fitness goals. Here are a few different strategies to try to keep off some of those unintended extra pounds that get packed on over the holidays. Low-maintenance exercises: When going to the gym is not an option, body weight exercises are a great way to workout, with no equipment necessary. Combining exercises like squats, push-ups, and mountain climbers can still be a very effective workout. You can find numerous body-weight circuit ideas online. Make sure to keep an eye on form to reduce the risk for injury and get the most out of your workout. Interval style training: Another great option when short on time is doing some type of interval training. This can include any of your favorite cardio exercises like cycling or running, body weight exercises, or strength training. Interval training is working really hard (roughly 80% of your max effort) for a short amount of time, like 20-60 seconds for example, with a longer and lower intensity effort (roughly 40-50%) for 30-90 seconds depending what kind of interval training you are doing. There are several great videos on Youtube that you can utilize. If you are looking for an advanced session, look for Tabata workouts! Interval training gives you a higher caloric burn, post workout, which means you continue burning more calories even after the workout is complete! Keep time on your side: Before the day gets ahead of you, plan to do something in the morning. This way you’ll have it done before other things come up or you lose motivation. Another way to be ready at any opportunity to squeeze in some activity, is by keeping an extra workout bag or gym shoes with you wherever you go. Lastly, if self-discipline isn’t really your thing, try planning a workout ahead of time with a friend or family member to help keep you accountable. Traveling smart: If you know you’ll be traveling for this holiday season consider looking into a gym promotion or deal going on near wherever you’ll be staying. If you invest in something ahead of time that you know you won’t be able to use again, you might be more dedicated to utilizing it while you can. Another option with traveling is if you are staying at a hotel and no hotel gym is available, look into body weight exercises to do in your room ahead of time. Furthermore, if you know you’re going to a holiday party with lots of good treats and drinks and are afraid you might over-indulge, try and eat something beforehand to prevent you from over-doing it. Create a step goal: A full blown workout might not be in the cards for you this holiday season. However, you can create something like a step count goal and use a fitness tracker or an app on your phone to help you keep track. 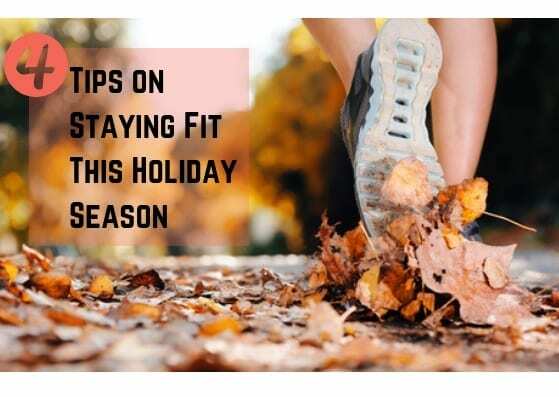 To fit in those extra steps you could go for a walk with a friend or family member after a big meal, or try parking further away at grocery stores when running out for those last-minute items. Lastly, try taking the stairs instead of elevators or escalators in malls, airports, or hotels. Seasonal activities: Another option to say fit could be signing up for a holiday 5k. This could be a great goal to plan for and complete! Also, depending where you are celebrating the holidays this season, planning a seasonal activity, like snow-shoeing, skiing, or winter hiking could be fun to work into your holiday plans. This could even become the start of a new fitness family tradition! Take your time! Really try to engage all of your senses while eating, thinking about how the food smells, tastes, and feels. Don’t waste your calories. Try and choose only things that really wow you. Start with smaller portions to see if you are really enjoying every bite so you don’t waste food or if want to go back for seconds on the food that counts! Only eat when you’re hungry. Check in with yourself and see if you’re eating because everyone else is, or if it’s because your stomach is telling you to. Don’t avoid anything completely. You might think keeping something on your no-no list will be helpful, but it actually might make things worse. You could end up over-indulging on other foods instead! Keep portion control in check by using a smaller plate and eating the things you want in moderation. Eat filling foods first like lean meats and vegetables that are higher in protein and fiber. Keeping your health and fitness a priority over the holidays can be a challenge, but making goals and setting yourself up for success can go a long way in feeling much better about yourself come January. If you need help setting up nutrition or fitness goals, feel free to call our office to set up an appointment with our Nutritionist. Come see us at Cornerstone Health Community! We're bringing a new kind of medical practice to south Denver! Quick and easy - download our contact card for your phone! Cornerstone Health Community is south Denver's medical home for Functional Medicine, Lifestyle Medicine, and Primary Care. We are located conveniently near the Denver Technology Center (DTC) and I-25, across the street from the Greenwood Athletic and Tennis Club.